Ernesto Valverde insists his decision to exclude Ousmane Dembele from Barcelona's squad to face Real Betis is not a punishment over reported ill-discipline. France winger Dembele was a noticeable omission from the party selected for Sunday's clash with Betis at Camp Nou. It comes amid headlines in Spain this week that Barca were unhappy with the way Dembele informed them he was unwell to train on Thursday, while it is also claimed there have been several instances of the winger breaking club rules. Valverde, though, insists he makes decisions purely for the team and the club are determined to help Dembele realise his potential at Camp Nou. "No [there is no punishment], everyone can interpret it as they see fit. This is a team. I try to do my best for my team and for my club," he said. "The internal issues are internal. What I do is make sporting evaluations about what can be good for us and the rest is another question. We want to help players to be better and we want to help everyone. "Sometimes he's going to play, sometimes he won't, but he's got a learning curve, I do too. We're a team; we press forward. "We are talking a lot about those who are not [in the squad] and we have to talk about those who are. "What we expect is that the team and the club, which has made a large investment with him, take advantage of his talent." 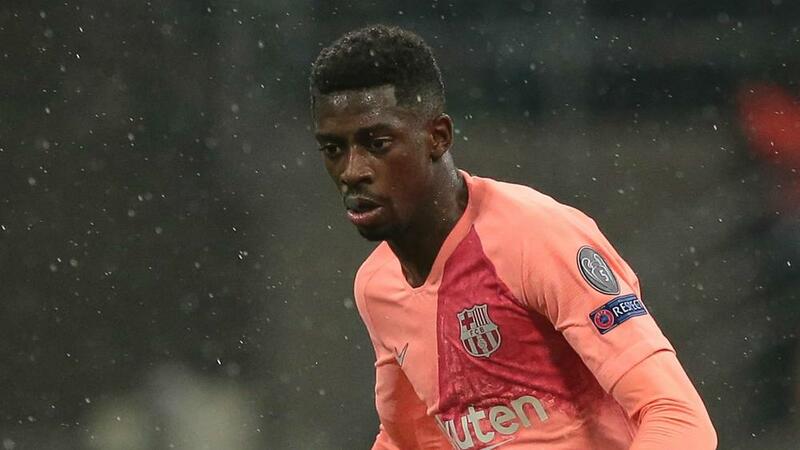 Valverde also suggested that Dembele will not be allowed to leave on loan during the transfer window. "We always look at transfer windows to strengthen the squad as best we can," he added. "Dembele's talent is something that is hard to match anywhere. We need to work hard to get the best out of his talent. "We want to see the best of all the players in the squad, always. We want them to have a positive impact on the team and negative impact on the opposition that's what we want, we need to help them to do that. "I've said many times Dembele has an incredible talent and we want him to show that every day. "He's a great player and we're expecting great things from him, I really don't have anything else to say about him." Conversely, Valverde was delighted with Malcom's impact off the bench in Wednesday's 1-1 Champions League draw at Inter, with the winger scoring two minutes after replacing Dembele off the bench. Malcom has made just one start in all competitions since joining in the last transfer window from Bordeaux and Valverde praised his attitude. Asked if the Inter game was a turning point for Malcom, Valverde replied: "Well, let's see. It depends on how the player performs. "It's always the manager who decides if he plays or not. He's taken a while to break into the team; he has a wonderful attitude. "He has things to learn, there's a long season ahead. We'll see if he plays but the fact he came on and scored generates some security and we should take advantage of that."